It might be hard to put fishing and farming together in your mind—but in fact, the health of our nation’s trout rivers and streams is directly related to the health of our agricultural land and water. Think about it: Those same creeks and watersheds that feed agricultural crops and pastures also nurture fish and wildlife. If we don’t take good care of our working lands, our home waters and wildlife will suffer. That’s why the Farm Bill is so important to Trout Unlimited. It’s no stretch to say the Farm Bill’s Conservation Title is one of the most effective, pragmatic conservation programs ever enacted in our country. We need to keep it working. Farm Bill conservation programs—with alphabet soup names like EQIP and RCPP—aren’t familiar to most Americans, but they provide support to ensure that farmers and ranchers have the resources to be good stewards of their water and soil. Every five years, the Farm Bill is up for reauthorization—and the current Farm Bill expires in September 2018. 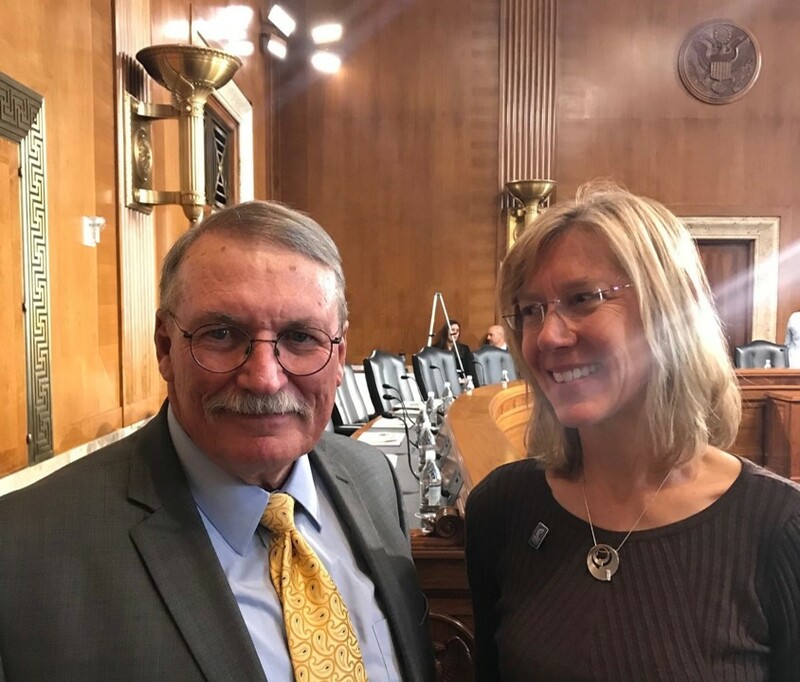 This week, Trout Unlimited’s senior water policy advisor, Laura Ziemer, is in Washington, D.C., testifying before Congress on how to boost local partnerships and solutions to improve drought resilience in the West. She's also meeting with lawmakers to urge full funding of conservation programs in the new 2018 Farm Bill, and ask for changes in the law to support even more partnerships between TU and producers, with more benefits for healthy streams. At present, that funding is not assured, but the changes in the law TU has suggested is gaining support. Testifying: TU's Laura Ziemer with Patrick O'Toole of the Family Farm Alliance, who have been working together to get important changes to the Farm Bill to make it work better for both producers and healthy streams. For decades, TU has been working with agricultural producers on the twin goals of making agriculture production better while enhancing stream and habitat health—and Farm Bill conservation programs have played a vital role in those partnerships. In the West, for instance, Farm Bill programs often help pay for irrigation upgrades that deliver water more efficiently, leaving more water instream to benefit flows and fisheries. In the East, Farm Bill programs might help fund fencing projects to keep cows out of streams —a low-tech but very effective approach that pays high dividends for local watersheds. In West Virginia, TU has worked with hundreds of farms to stabilize eroded streambanks and install more than 1.5 million feet of exclusion fencing to keep cattle out of streams—improving more than 75 miles of stream habitat. At the same, TU has helped producers maximize agricultural production through improved grazing management and off-stream water sources. The enhanced water quality and habitat has boosted numbers and size of native brook trout—the West Virginia state fish. In eastern Washington, EQIP funding has leveraged more than $5 million to improve water delivery systems for hay and apple crops in the Methow and Yakima basins. These new diversions, piping and efficiency projects have also improved river and stream flows for ESA-listed chinook and steelhead populations in key tributaries. In the Owyhee, Malheur and Salmon Falls watersheds of Oregon, Idaho and Nevada—a high desert ranching landscape hard hit by severe drought—a $1.3 million investment through the Regional Conservation Partnership Program (RCPP), matched by 21 regional partners, is making possible local projects that keep water in stream longer, benefiting both livestock and wildlife and fish. Unfortunately, these wise investments in our nation’s water and soil health have been drastically scaled back in recent years: The 2014 Farm Bill slashed the Conservation Title by approximately $4 billion over 10 years, with the conservation cuts effectively rising to $6 billion under mandatory sequestration. So, TU’s Ziemer is making the rounds with lawmakers to deliver a clear message: Farm Bill conservation programs are working for America’s working lands and home waters—and they deserve full funding. The health of your favorite local fishing lakes and streams may depend on it. Learn more about Farm Bill programs and TU’s partnerships with ranchers and farmers here. A River’s Reckoning from Trout Unlimited on Vimeo.